Ah, Christmas at the beach. Trust us: when you get used to it you really don’t miss the snow at all. 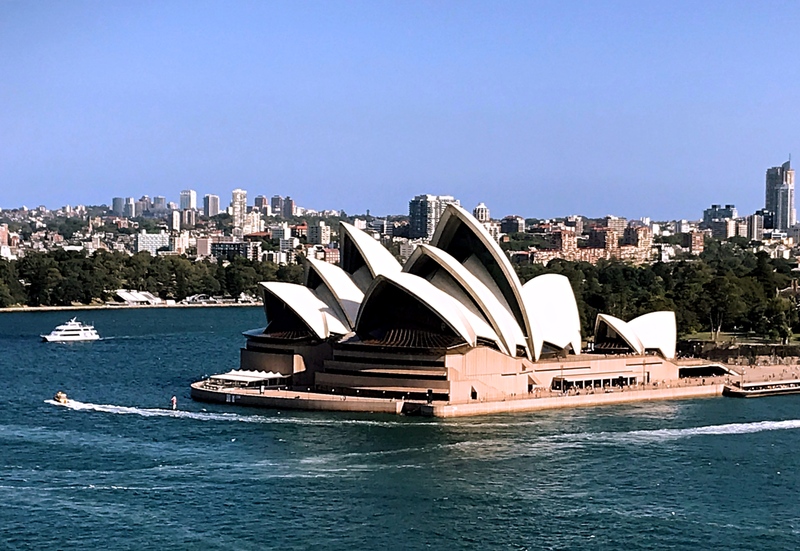 Founded on one of the great natural harbors in the world, Sydney got its start as part of the British Empire in 1770 when James Cook dropped anchor not far from today’s downtown area. He reported that the locals weren’t happy to have him around; wise people, apparently. Over the next several years England was looking for a place to store convicts and decided Australia was just the ticket. Thus on January 26, 1788 – today’s Australia Day or what indigenous people call Invasion Day) a ship full of convicts, guards, and livestock pulled into port. Interestingly, the early settlement – numbering over 4,000 convicts in just a couple years – had no prison. The punishment was called “transportation,” and Australia itself was the prison. Fast forward a couple hundred years and the old penal colony is a humming metropolis of 4.4 million people, one of the world’s showcase cities. 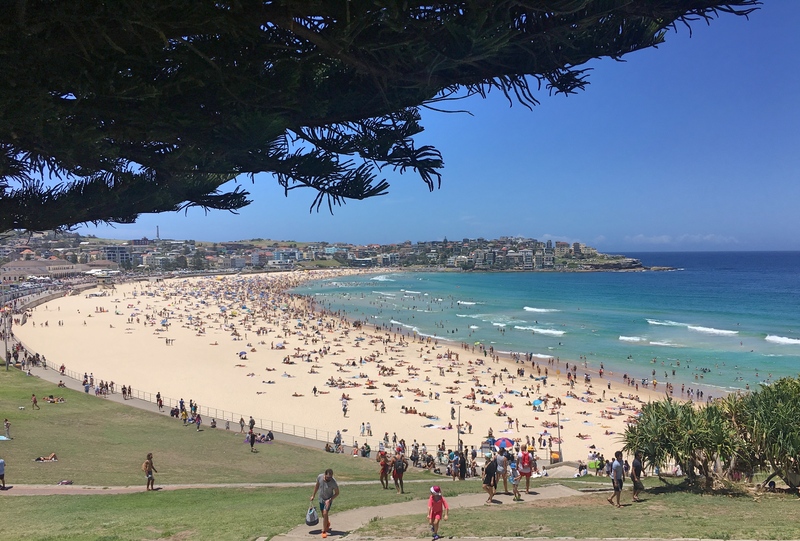 Iconic places like the UNESCO-listed Sydney Opera House and Harbor Bridge, world-class beaches in neighboring Bondi and Manley. Great restaurants, wonderful hiking trails, a subtropical climate, and a multicultural melting pot: fully a third of Sidneysiders, as they’re called, speak a language other than English at home. So yeah, there’s a lot to love about Sydney. And the Sydney Harbor Bridge. Twelve years ago we paid an obscene fee to climb the bridge up along that top span and found it seriously disappointing. So this time we just enjoyed the view from the water. Altogether we spent a little over three weeks in Queensland before flying down to Sydney, the capital of New South Wales. 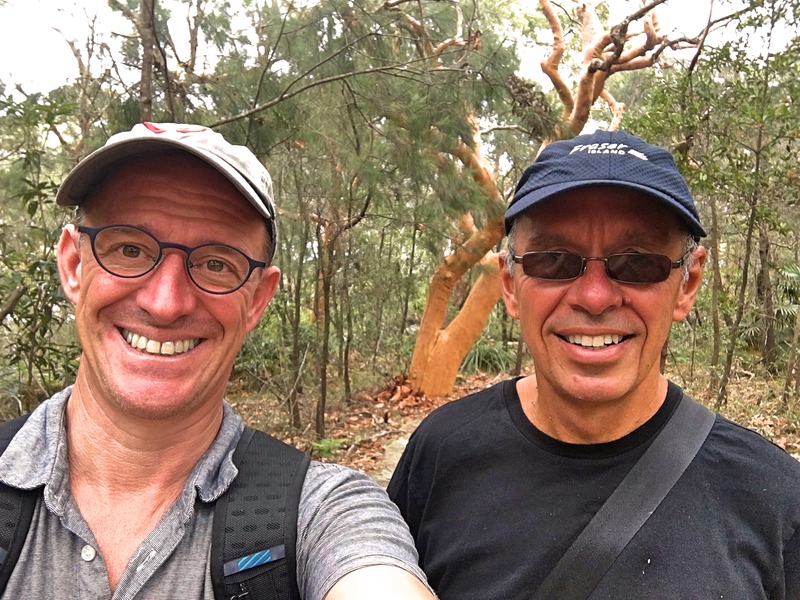 One of the things that we’ve learned during this time is that ground transportation is all but out of the question for us; with all due respect to our friends Piers and Charlotte, driving nearly the entire perimeter of Australia, for us the distances are just too massive. So we’re flying damned near everywhere. And how do we spend our Christmas break in Sydney? 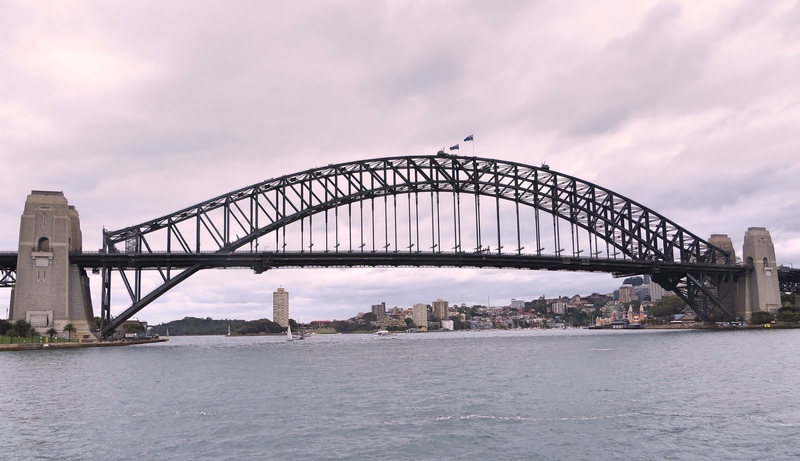 We were here 12 years ago so some of the basic tourist things – touring the Opera House, climbing the Harbor Bridge – were already checked off. Which is a good thing, since it left us time to search out restaurants that are still open. This is not just Christmas and soon New Years: down here it’s also the start of summer season, so lots and lots of places are starting to close down for a week or two or even more, a lot like Paris in August. When Mark went to TripAdvisor to see what restaurants would be open on Christmas Day, Indian restaurants were heavily over represented. That worked out for us. 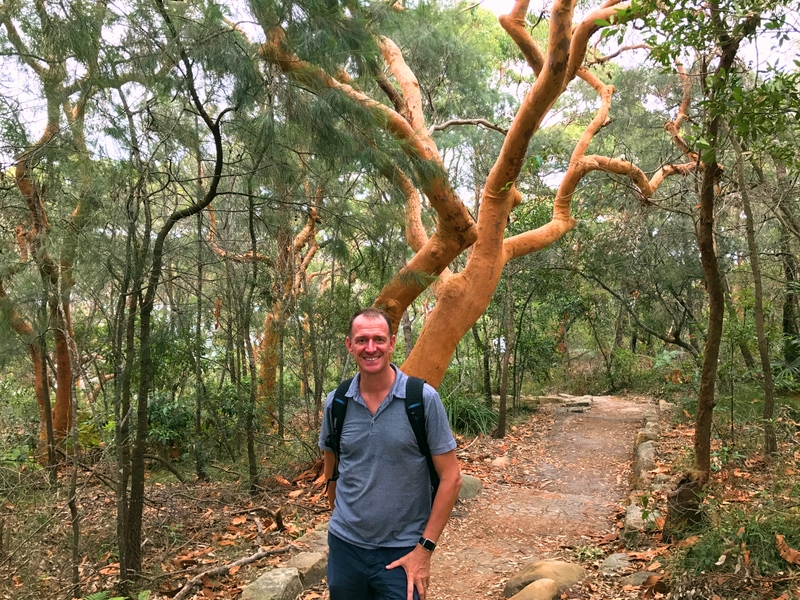 Mark in the Sydney Harbor National Park on the Manly Scenic Walkway. We’ve seen that tree behind him all over the place in Australia. 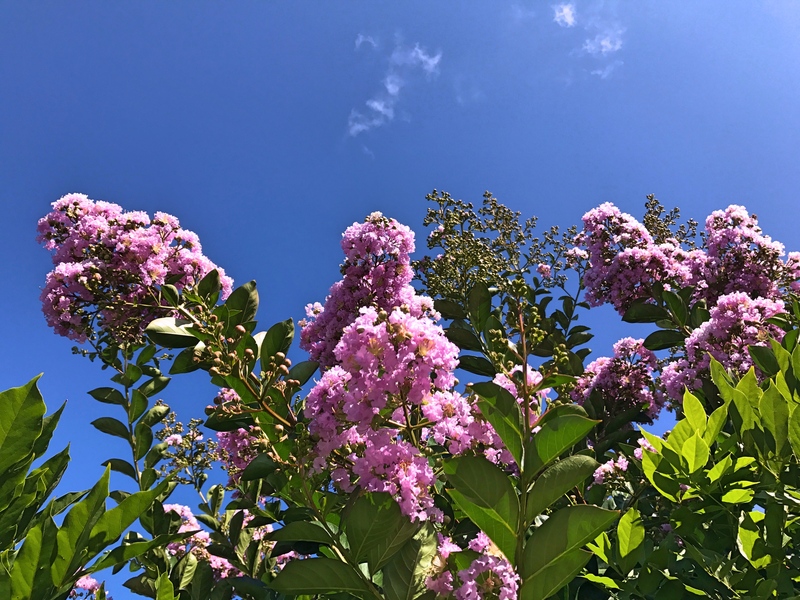 It has the odd characteristic of shedding its bark, leaving the reddish droppings all over the ground and the trunk itself remarkably smooth and colorful. Our major activities were two long hikes. 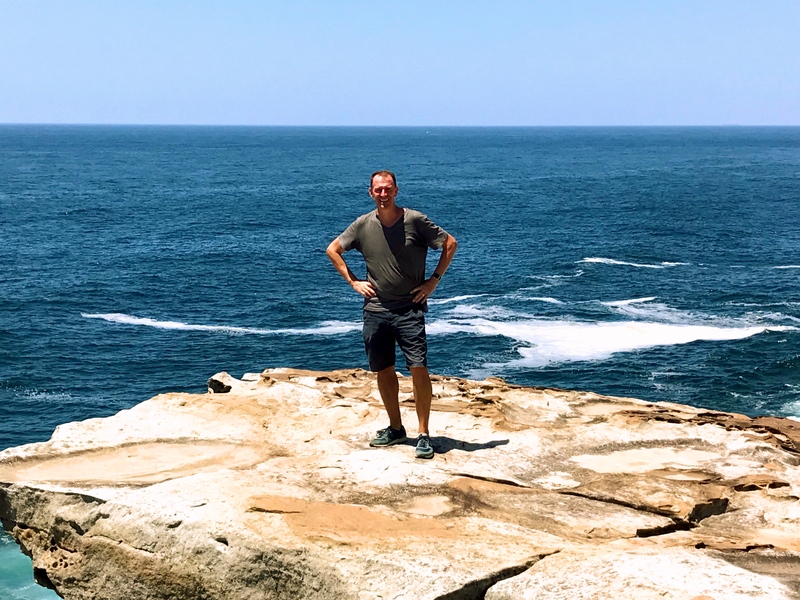 First up was a ferryboat out to Manly, a beach town just north of Sydney, to hike the Manly Scenic Walkway back into Sydney. (Yeah, after all that time in Queenstown, New Zealand, and Queensland here in Australia we figured it as time to get Manly. Heh.) 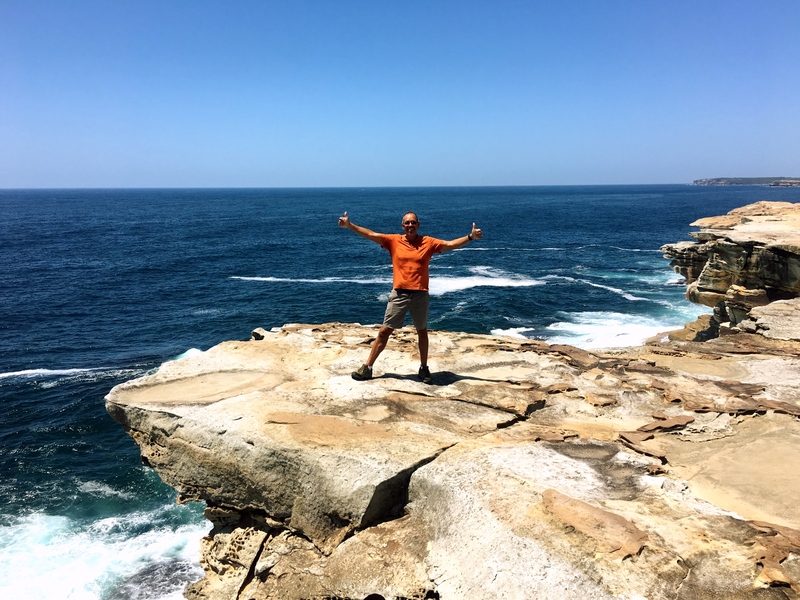 The first six miles or so were along the coast and through the Sydney Harbor National Park. After a great lunch at an Italian restaurant it was another six miles back to central business district where we were staying. Two days later, Christmas Day, we decided to up our game a bit. 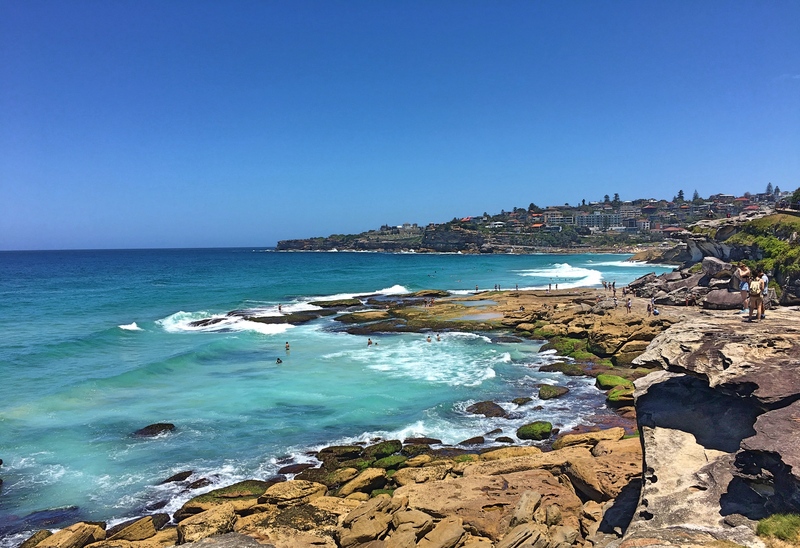 The four-mile Coogee to Bondi walk is described as Sydney’s most popular walk, connecting two great beach communities just south of Sydney with a spectacular coastal walk. But first we decided to walk out to Coogee. 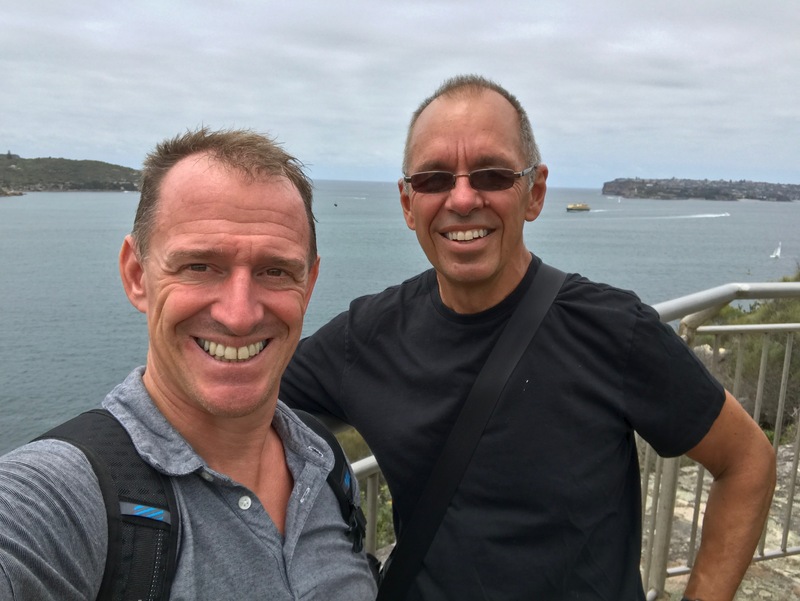 And then, after lunch in Bondi, we walked all the way back to Sydney, altogether probably 16 or 17 miles. What a great way to spend Christmas! Mark along the Coogee-to-Bondi walk on Christmas Day. No snow in sight! 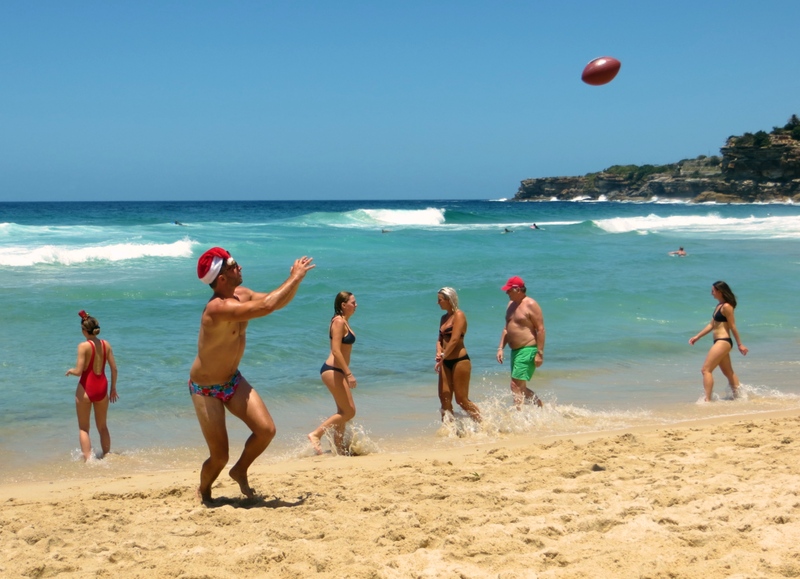 Santa playing football on Tamarama Beach, en route to Bondi. The water was fabulous but the surf was intense; Mark watched the lifeguards drag out one woman who got caught by the tow during the 15 minutes or so I was in the water. Apparently they pull out multiple people every day, but particularly on holidays like this. There was one strikeout, Sydney’s Museum of Contemporary Art. We’re not sure what the problem was – nothing that was even remotely familiar to us? just a weak collection? the wrong day? – but nothing there to grab us. Selfie time on the Manly Scenic Walkway. Note again that bark-less tree behind us. Yeah, that’s me. And no, we didn’t get too close to the edge of the rock. You can’t see it too well from this angle but just a little behind me the overhang is pretty significant. The chance of it breaking off was small, but the consequences would have been significant. 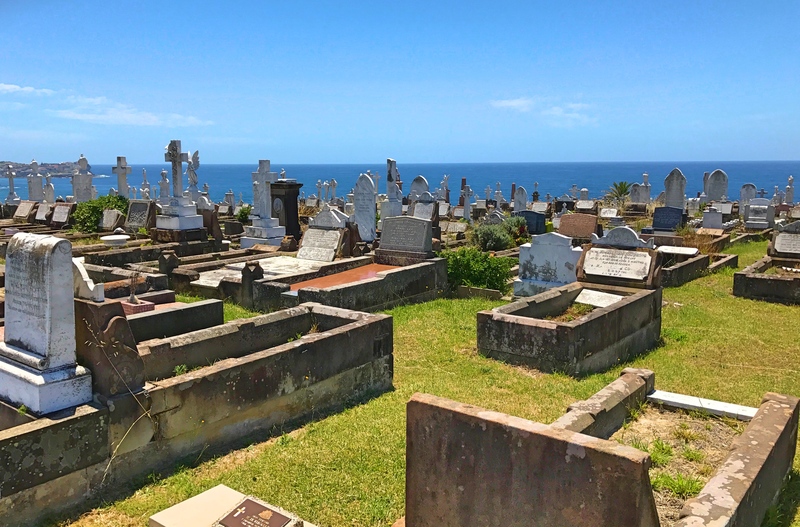 Part of the Bondi-Coogoo walk was washed out in a storm just a few months ago, so we were rerouted through this huge cemetery. Very strange watching hipsters carrying their surfboards through a cemetery. 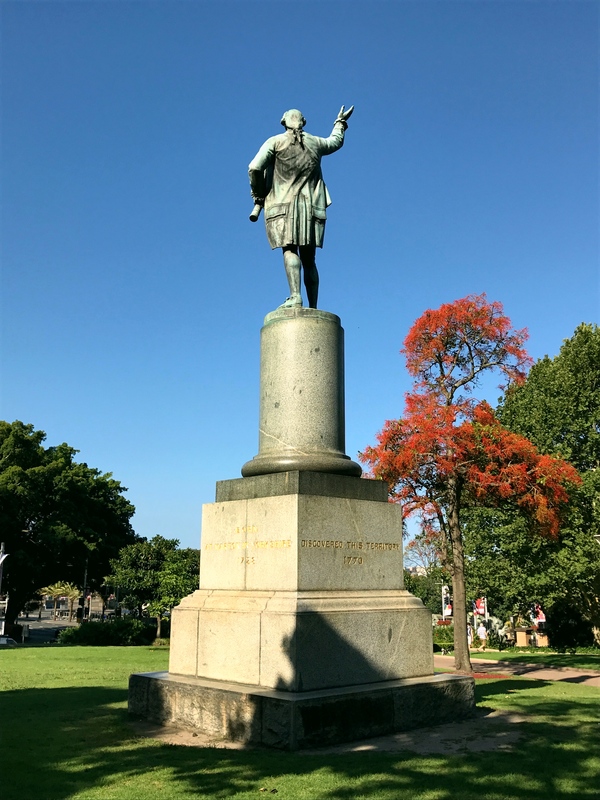 A statue of James Cook in the beautiful Hyde Park, described as having “discovered” Australia. Strange concept to “discover” something where thousands of people already live.